Mapo Tofu (麻婆豆腐) is a fiery Sichuan pork and tofu stir-fry with the hallmark málà(麻辣) balance of tongue tingling and spicy. The best part is that it can be put together in under 15 minutes, making Mapo Tofu the perfect weeknight stir-fry. Tofu sadly has the reputation of being bland, but one bite of this blazing hot stir-fry and you’ll thank your lucky stars for the rich, creamy cubes of tender tofu that soothe your scorched tongue. 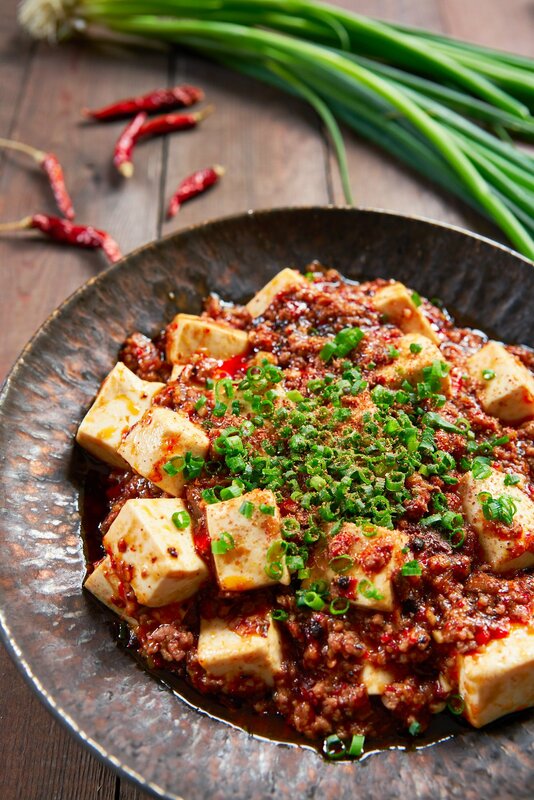 But Mapo Tofu isn’t just about causing an oral 5-alarm fire; it features a broad palette of flavorful aromatics like scallions, ginger, and garlic, as well as a wallop of earthy umami thanks to the pork, doubanjiang (broad-bean chili paste) and douchi (豆豉 – fermented black beans). 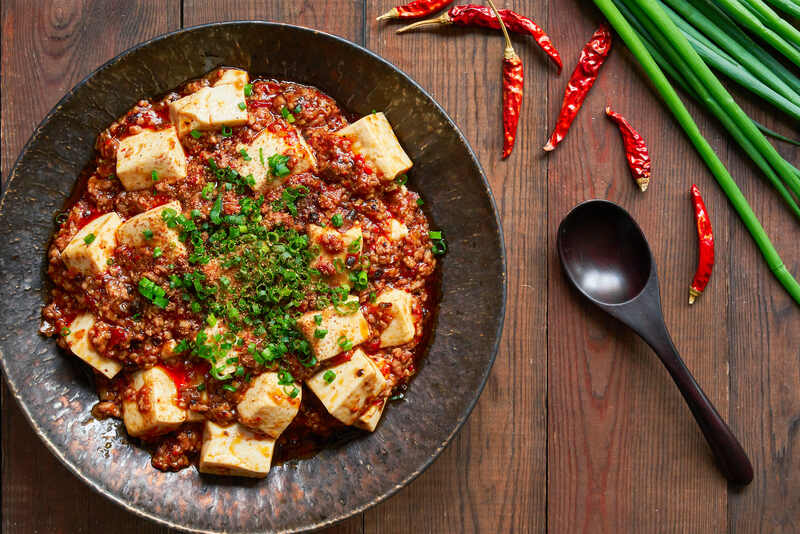 Like many Chinese dishes, Mapo Tofu has migrated across the world, adapting to local taste buds along the way. I’ve written about my milder Japanese-style Mapo Tofu before, but for this version, I wanted to stay true to the original Sichuan preparation, while adapting the cooking techniques to work in a western kitchen (i.e., a kitchen without a high BTU wok burner). 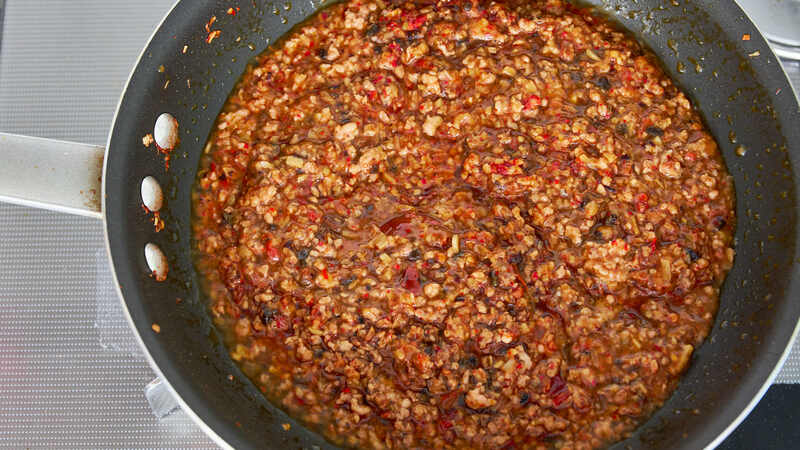 It’s not hard to make and comes together in minutes, but there are a few key points to make the best Mapo Tofu. The first is that because this dish (like all stir-fries) comes together so quickly once you start cooking, it’s imperative that you measure out and prep everything in advance, so you can toss in one ingredient after the other. Doing this over low heat so you can prep while you cook is a sure way to mess this up. The second key point is to parboil the tofu in salt water before adding it to the stir-fry. 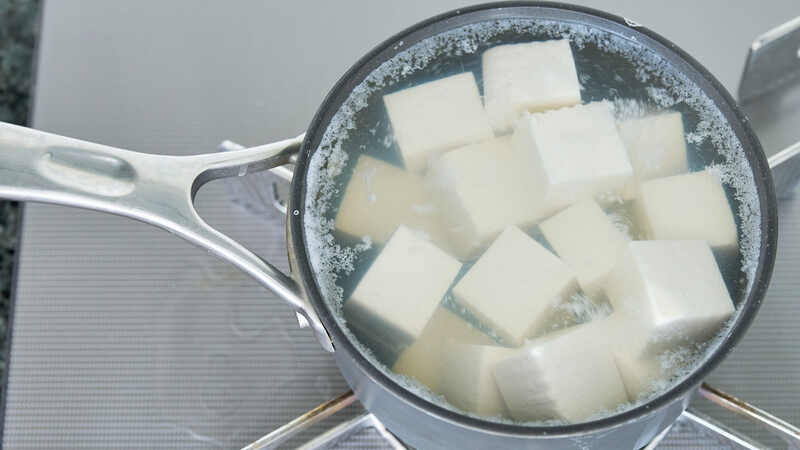 It may seem like an extra hassle, but this step draws out excess liquid from the tofu, ensuring your Mapo Tofu doesn’t end up watery when you serve it. It also has the added benefit of firming up the tofu a bit, so it doesn’t fall apart as you toss it with the sauce. Finally, I like to be able to eat my Mapo Tofu with rice and chopsticks, so I make the sauce a little on the thick side. 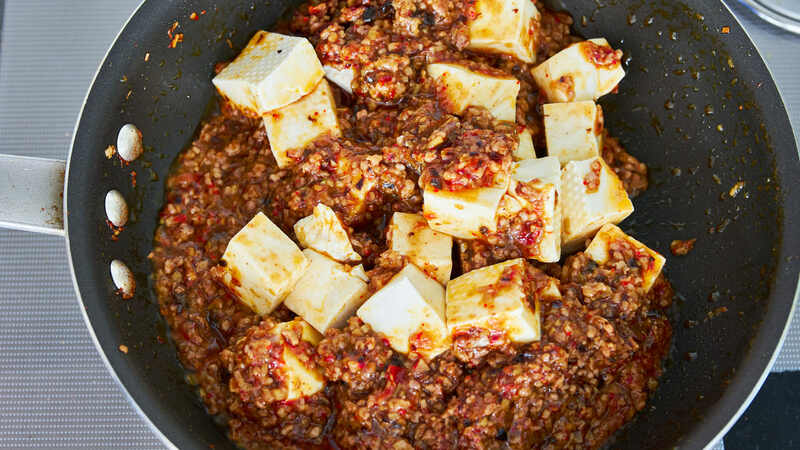 This gives the Mapo Tofu a beautiful glossy sheen and allows for the sauce to cling to each cube of tofu, ensuring you get an even mix of both with each bite. If you like your Mapo Tofu a bit saucier, you can halve the amount of potato starch. Bring 2 cups of water along with 1 teaspoon of salt to a boil. Add the tofu and cook for 1 minute. Gently tip the tofu into a colander and drain well. Whisk the low-sodium chicken broth and potato starch together, and set them aside while you prepare all the other ingredients. 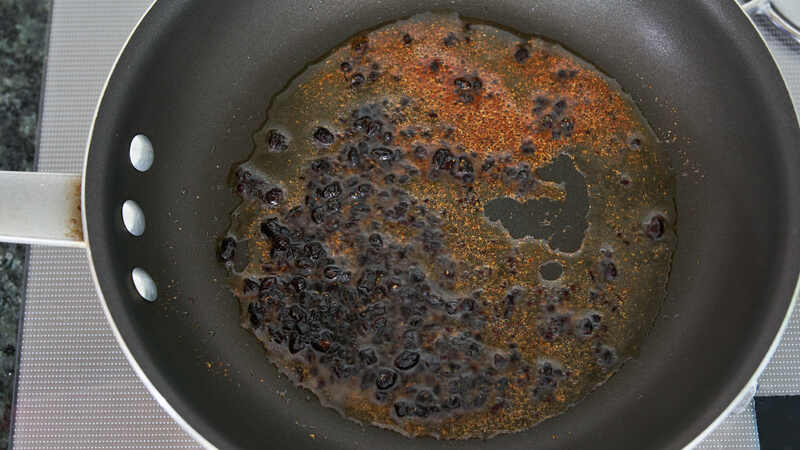 Heat the vegetable oil and sesame oil in a frying pan until very hot (but not smoking). 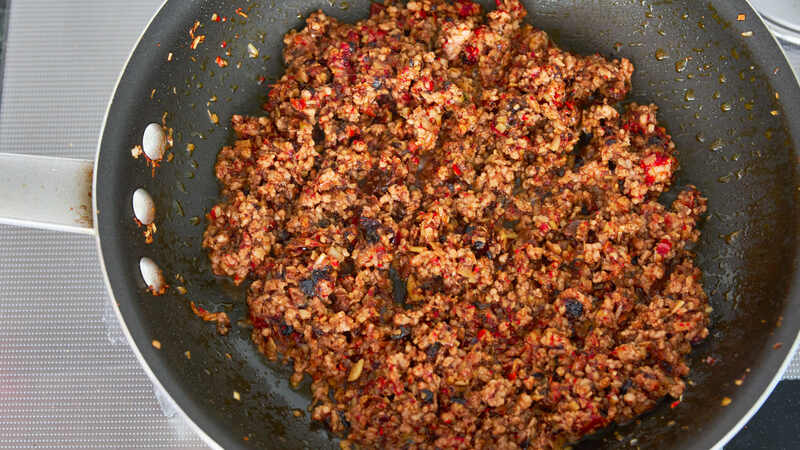 Add the Sichuan pepper and douchi and stir-fry for a few seconds until fragrant. 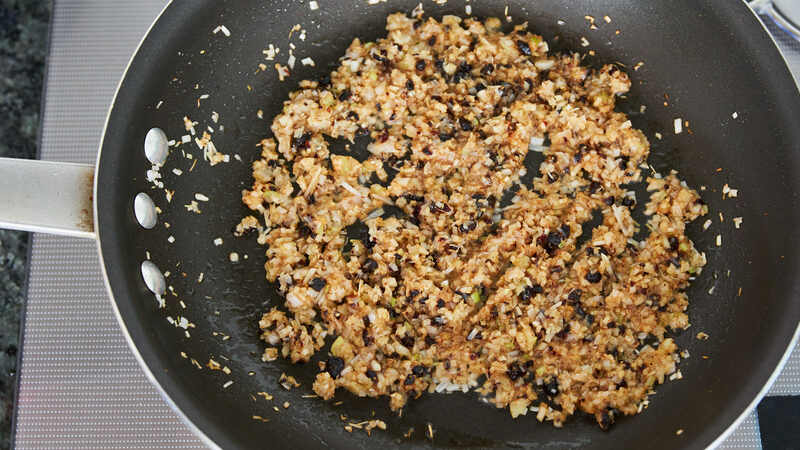 Add the garlic, ginger and white parts of the scallions and stir-fry for a few seconds until fragrant. 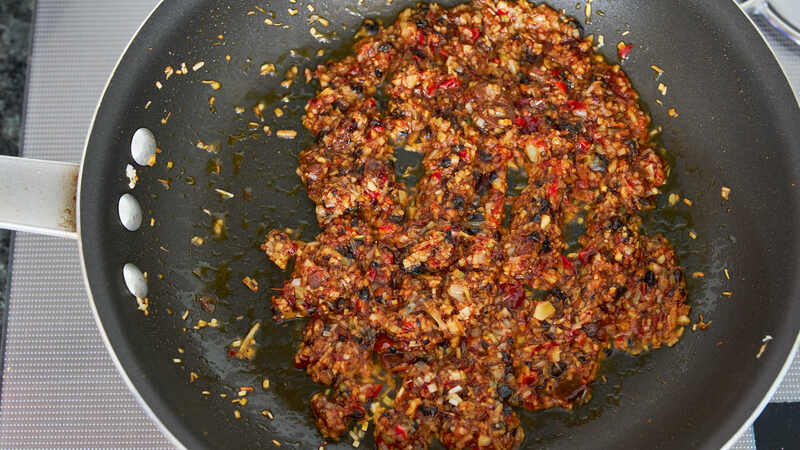 Add the pork and stir-fry breaking it up into small pieces as you go. Stir the chicken stock and then pour it in. Let this boil until it thickens. Add the tofu and toss in the pan to coat evenly with the sauce. Serve the Mapo Tofu garnished with the scallion greens and hot rice. *Sichuan peppercorns are best when freshly ground. If you grind them yourself, roast them in a dry frying pan until fragrant and then pick out any black seeds and discard, saving only the hulls. The seeds will create a sandy texture if you grind them together. Grind the hulls in a spice grinder or using a mortar and pestle.